Entering the 2013-'14 campaign, the saturated storylines surrounding Marc-Andre Fleury clearly indicated that few pundits (or fans) put much stock in any of the maligned goaltender's future regular season accolades. Because, following a single series victory in four years and consecutive playoff implosions, The Flower's typically solid in-season performance, for many, now carries less merit. So, when Dan Bylsma and Ray Shero threw their weight behind the franchise net minder last summer, an unsure fan base held its collective breath, vowing that the regular season would mean virtually nothing without springtime success. Fleury, however, continues to perform at a level that proves difficult to ignore. With the preseason loss of Tomas Vokoun, Fleury has been pressed into more action than anticipated this year. So far, he hasn't disappointed. 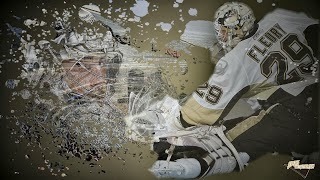 With a .917 save percentage and 2.26 GAA, Fleury boasts some of the best numbers of his career. What's more, his four shutouts (one shy of his career-high) trail only Tuuka Rask's league-best five whitewashings. Most importantly, though, The Flower continues to win. In fact, his 29 victories pace the circuit as we approach the Olympic break. And, at his current pace, Fleury may even challenge Martin Brodeur's NHL record of 48 wins in a single season. Not bad for a guy who's regular season doesn't mean anything. Still, regular season success is nothing new to Fleury. At 29, just four goalies in NHL history possess more than Marc-Andre's 278 victories. And, according to Shero, “He's been a big reason we keep getting to the playoffs, which gets harder to do every year in this league. You can't just ignore that he gives you 35 wins every year." So, what makes this year different? Why does it stand apart from so many of Fleury's previous campaigns? Whether it's staying strong between the pipes behind an injury-depleted club that clings to a 2-1 win or making a jaw-dropping save late in a 6-5 thriller, Fleury has risen to the challenge regardless of what Pittsburgh asks of him. And, as a result, there's no denying The Flower's influence on the mockery the Penguins have made of the race for the Metropolitan crown. Yes, Sidney Crosby's assault on the Art Ross Trophy has helped carry the squad and the continued evolution of Chris Kunitz into an elite winger helps supplement one of the most talented rosters in the league. Meanwhile, the emergence of Matt Niskanen and Olli Maatta has anchored a blue line ravaged by injuries. But, without a doubt, Fleury's heavy workload has largely served to carry Pittsburgh to Eastern Conference supremacy to this point in the 2013-'14 campaign. Thus, maybe it's ultimately a good thing he'll have some time off during the Olympic break. After all, he can use the break to rest up for the only part of the season that matters.